Put on your Amish hat – we are making the butter ourselves! 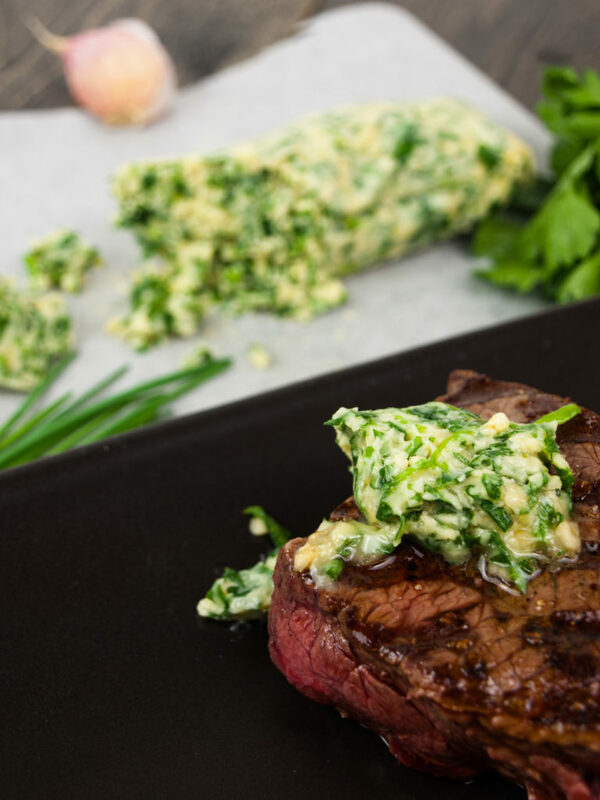 What is better than a thick slice of garlic herb butter on a nicely grilled piece of steak? Well, homemade garlic herb butter on that steak! Everyone should have made butter at least once in their lifetime! Yes, your arms will ache, you will ask yourself several times why you choose to make butter yourself, but the result will make it all worth it!! 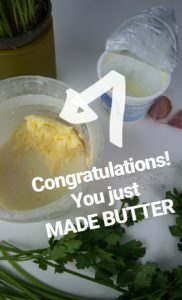 But the best part is probably that you can tell your guests that YOU MADE THIS BUTTER! They will probably not believe you, until you tell them step by step what you did. At least that is what happened to me the first time I made this butter. This herbed butter is perfect on a grilled steak, toasted baguette or grilled vegetables! But why stop here? Add chopped sun-dried tomatoes, anchovies, roasted onions, or even parmesan cheese! Once you know how to make this, the varieties you can come up with, will be endless! Just put this tasty stuff on everything! Check out the 5 easy steps below! Shake it up like your life depends on it! Fill the cream into a tightly closing container that is about two times the volume of the cream. Close and shake, shake, shake! 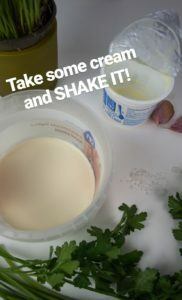 The cream will first turn into whipped cream; keep shaking violently till the whipped cream collapses again and separates into whey and butter. 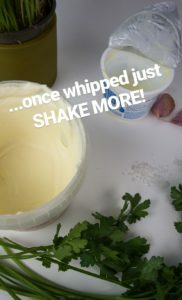 Keep shaking until you have one solid ball of butter in your container. 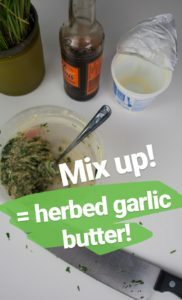 Herb up your butter like your life depends on it! Grate the garlic or dice it up very finely on a chopping board. Put the teaspoon of salt on top of the garlic and keep mashing and scraping it with the flat side of a knife. The garlic will slowly turn into a paste. Chop up the parsley and the chives. Combine the butter with the salty garlic paste, the parsley, the chives, a dash of worcestershire sauce, as well as a good twist of black pepper. Mix with a fork until well combined. Put the herbed butter onto a sheet of cling film, roll into a sausage and fold in the ends of the sausage roll. Chill the butter in the fridge until needed. Remove the foil and cut the firmed up butter into slices. Smear the garlic herb butter on a nice piece of meat, toasted bread or on top of grilled vegetables! Let me know what you think about the recipe in the comments below! Did you ever try making butter yourself or is this just one step too far? 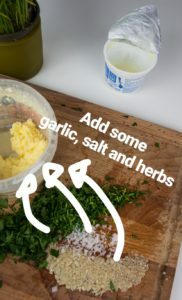 What are your favorite herbs to put in butter?